When planning your next trip and looking at flights, you might want to look this way. Here are some things to keep in mind before buying your ticket, which may save you some money. They may seem obvious to some, but they have saved me a lot of money. #1 When are you going? If you’re flexible about time you might save some money. 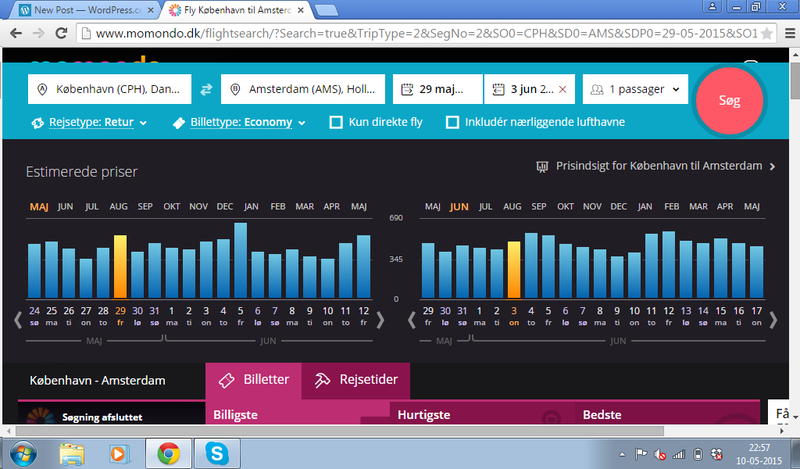 Most primary and secondary sites have a feature that allows you to see the prices for the same trip on different days. I’ve heard people say there is a rule to which days are cheapest, yet I’ve found it all depends on your destination and the time of year. Sometimes there’s a significant difference. Some of you may say this is an obvious thing to check, but I know many who find planning holidays overwhelming. They don’t really look around, but just take the day they’ve decided on. Another thing about time is what time of the day you will be flying. Often the annoying times are cheaper. These are often the insanely early in the morning or really late in the evening. The ones that can seem slightly inconvenient to a lot of people. #2 How long will you wait? I’ve often found longer journeys are a lot cheaper when they include one or several layovers, rather than a direct flight. If you’re going on a short trip, the lost time may not be worth it. However, for longer trips it can pay off. So don’t just tick off the ‘direct flights only’ box. Always shop around, don’t just go with the first offer you see. If you are going to buy a new phone, do you just go in to the nearest shop and buy it? No, most of us probably look around to get the best deal. The same principle should be applied to buying plane tickets. It’s a good idea to use various websites such as momondo.com and cheapflights.com to see which would be the cheapest. They often show prices for different airlines, and let you tick off the box about whether you’re really strict about your travel dates. However, when you’ve found your choice, do check the same trip on the airlines own website – we found that the best and cheapest flight on momondo wasn’t always the best nor cheapest flight when you had to book it. For example they don’t always make sure you get your bags with you – so check, just to be sure! #4 Going to more than one distination? We recently went on a little world trip and found this a useful thing to check. Sometimes it’s cheaper to buy a roundticket, though it doesn’t actually have to end where you started. It just becomes a trip with a very long layover, your other stop. Sometimes several singles can be cheaper than a roundtrip. So do check it all. Only thing to keep in mind is that you book your flight tickets for distinction A to B the same place. Then you can always book from another place for B to C. It just means that in case there is a delay or cancelled flight, they will deal with your connecting flights too. Most of the airlines anyway. Before you give your card details and press the ‘buy button’, do make sure to check a few things first. These might influence the final price. Several airlines don’t automatically give you a check-in bag, so if you want that you have to pay extra for that. Some times you are actually also required to pay to get a meal on board.